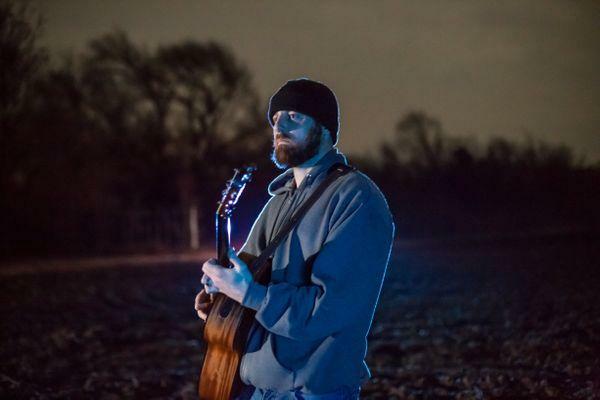 Dusty Grant is a singer-songwriter based in Wichita. I’ve been writing songs since college. I was about 19 when I started. I got my first taste of writing writing rap metal. I was in Omaha, Nebraska, that’s where I got my start. I had a band that was fairly popular in the area. Then I got more into metal scene. Now, I’m writing all the stuff by myself. I’m writing all the guitars and everything. The biggest thing for me is the performance aspect of it. As a solo guy, it’s just you with a crowd, so if there’s a screw up or something like that you have no one to blame but yourself. Whereas when I was in metal bands, I could run around, I could scream. The lyrics may be inaudible. It’s a more focused environment when you’re a single guy up there playing guitar by yourself. The writing aspect is actually easier because I don’t have anyone to ask. I write something, I like it, I go for it, whereas in a band you’ve to ask somebody, people get their feelings hurt. It’s a relationship is really what it is. Being a solo guy, I can proceed with the things I want to proceed with without asking anybody.